Outdoors with a hint of the indoors always make for the best venue to party. And what better place than the terrace. A terrace garden is a good space to chill out with friends and enjoy good conversation and food amidst the greenery and open feeling that only a terrace can offer. However, along with good food and music, ambience also needs to be addressed before throwing a roof-top party. An exposed terrace garden will need a shelter for which patio umbrellas or a tarpaulin marquee would be ideal. Stone benches or platforms, free-standing hammocks and swings and individual metal and cane outdoor chairs are some options in seating. Round bistros with a folding accent table make for a good addition to this space. Choose a teak bistro table that folds up easily, making it a handy piece of furniture that you can move when you want to. Do not over-furnish the space as movement will be restricted. In fact, if you plan to throw outdoor parties regularly, then it is better to have a permanent seating arrangement in terms of concrete or stone benches in the terrace garden or a set of wrought-iron sofas and chairs, minus cushions of course. 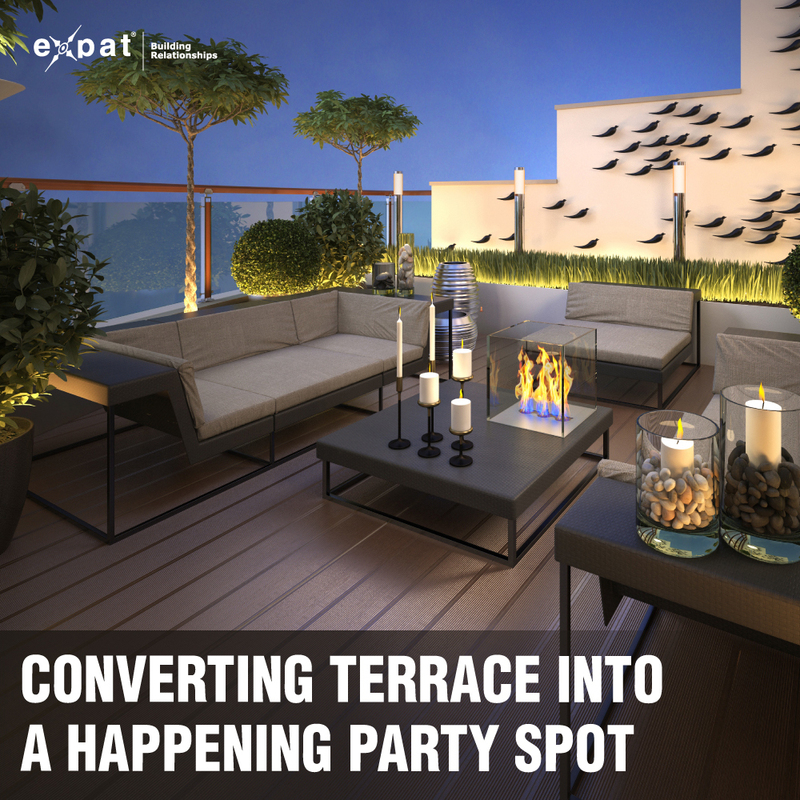 To add a twist to the terrace garden, it can also be designed on two levels, with the seating space and garden featuring at the higher level, with a snack counter set up on the lower level to enjoy light snacks. Fountains are another way of adding a touch of glamour. A faux copper floor fountain can act as a functional decor accent which will add a new dimension to the space. Ensure your terrace garden has enough green potted plants and flowers which not only add colour to the space but also brings it alive. Place artificial birds and potted hangings to make it look beautiful. The plants and the small garden that you have on the terrace should be the focal point. If you are having a dance party, then you can hire a DJ or if it is just a dinner party, you can have a music system playing soft music in the background. If it is a night party, hanging little lamps from trees makes for a pretty picture. Lighting is an important aspect while throwing an outdoor party. Traditional lamps such as lanterns and a kerosene lamp are apt for such occasions. Candles are another great idea but this depends on the number of guests you have. Place candles around for a small, intimate gathering. The lights should add to the atmosphere so that guests can enjoy the moonlight, the open skies and the cool, fresh air.